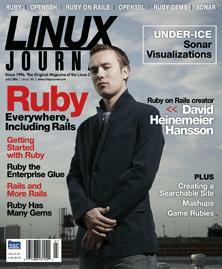 The creator of Ruby on Rails doesn't rail but opines. New to Ruby? Here's the primer you're looking for. A rich repository of modules called RubyGems awaits you. How to pull together a heterogenous environment with Ruby. If you want freedom, add constraints. The unsung OpenSSL command line. Take a glimpse at Webglimpse for search capabilities for your site. It's important to ask, who's watching the guard? Nicholas Petreley's /var/opinion It's free. It's proprietary. No, it's two (click) two (click) two distros in one.